This set of documents is suitable for a tender process in any industry. It is a complicated process made simple. We do not think use for a particular industry should affect this framework. Technical material will be included by you to the extent you think appropriate. The ultimate contract will be to suit your specific purpose. However, you can probably find a template for that too at Net Lawman (see below). You send letter of interest to your chosen list of possible tenderers. That letter incorporates your ground rules for the tender process and beyond. The letter is sent in duplicate with your request for one copy to be signed and returned to you. That constitutes agreement by the tenderer to comply. That first letter also sends a confidentiality agreement. You do not have to use it, but 90% of businesses will require this protection. Interested parties reply, and send back signed copy of your letter of terms and signed confidentiality agreement. You now send out the draft contract. You invite, but do not encourage, comments. 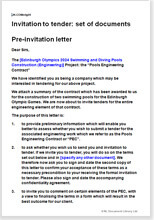 After a period of time you have specified, you send out a letter of invitation to tender against the final version of the contract you have prepared. That letter also sets out how you intend to deal with the tenders and encloses a set of rules for the tenderers. You can edit every document easily. A set of documents that provide a complete tendering process for a large or small contract in any industry.